As mentioned in the yesterday's report, a Major Accumulation Day right after a Major Distribution Day usually means the yesterday’s low will be revisited soon. Generally, the pullback during an up swing shall become larger and larger (as the up momentum inevitably weakening), so at least the size of pullback 3 should equal to the size of pullback 2. Forget about the “phantom bar”, we’re not there yet. VIX higher high while no lower low on SPX, usually VIX told the truth, so cannot exclude the possibility that the top was in already. According to Stock Trader’s Almanac, October expiration day, Dow down 5 straight and 6 of last 7. 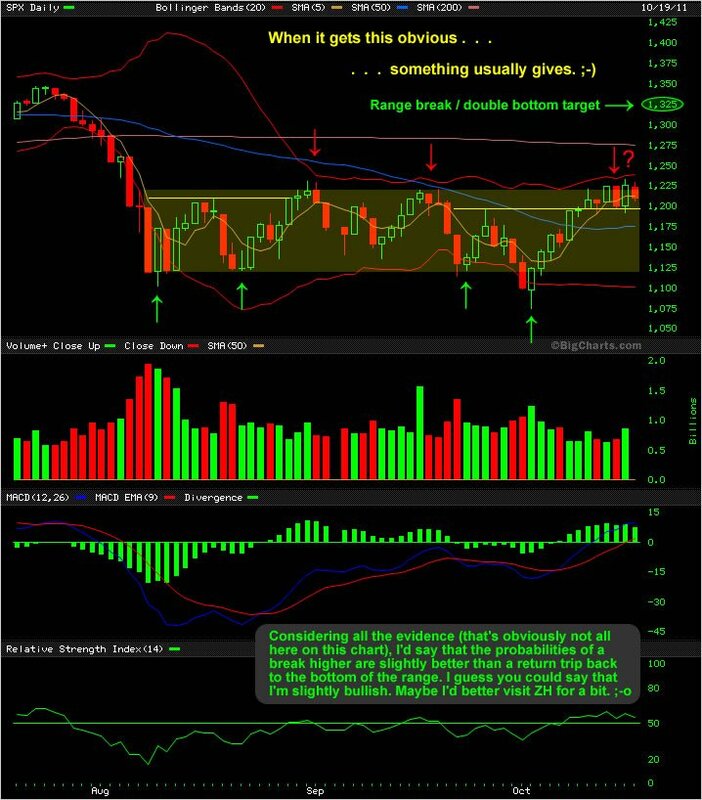 21 Comments on "10/19/2011 Market Outlook (More Pullback?)" hey cobra this pullback looks tiny… the big picture the pull back is more to 115 ? I didn’t say 115, could just be a direction only. I think you mean “Route A”, I didn’t have the target for route A.
I coincide ROUTE A is the way will go . this again cobra. For the NFLX trader… a very clean DeMark Weekly Combo Buy signal could trigger next week. A combo signal is more trustworthy than either a sequential signal or countdown signal alone. Ideally, we’d get a nice downdraft to 95ish level which fits well with support zones from mid-2010. NFLX report earnings after hours on Monday. It is a nice setup potentially given that we’ll already know the EU news regarding EFSF. If the potential S&P downside plays out and drags NFLX with it, I will definitely consider a long trade in NFLX. A trade of a couple weeks maximum. I don’t have an exit price target yet. Since it is a weekly buy signal that could trigger, technically you wouldn’t take the position until the end of next week, which means waiting out earnings which as always can go either way. not sure which one of you pillow-biters uses ichmoku system…but we have had strong resistance on the Dow at the 11650 area which coincides with both the Span B area of the cloud and of course my favorite a PnF resistance area. So this is tough resistance. A pullback is likely back to the 11225 area in short order. awesome charts ! Thank you. Thanks, I tend to forget cu. I’m not into DeMark, traditional indicators show temporary market weakness for SPX/NYSE, but very interesting that my tools indicate that cu might tank to 2.37 (and if cu tanks to 2.37, how can SPX stay up at 1190/1200, as implied by P&F and BPs?). Here a closer look at cu. A break of 3.20 points to further decline. Fortunately, DeMark correlates with the traditional indicators this time because it only shows temporary market weakness too, as a daily setup only applies for the following 4 days (ending Monday close). you forgot to translate one sentence (P-bar) to Chinese. One question, why didn’t you tinted the NO.3 zone from HH (123.50) ? sorry, still didn’t get it. Correlations don’t last forever and I think we’re going to see a decoupling of the commodity – equity correlation. In fact, I think we’re going to see an inverse correlation for the next few years based on my thesis that productive assets will perform much better than passive assets (the more dust something collects, the worse the performance, and the more productive something is, the better the annualized returns). This would suppose that stocks – with the blue chip consumer staples at the top of that list – would do best, and that commods will fall as rates rise. Copper and oil will do better relative to gold and silver since they are necessary for the productive process, etc., etc., but whereas copper was a lead these last couple of years, I’m not sure we can now trust it to give us good leading indications anymore for the foreseeable future.